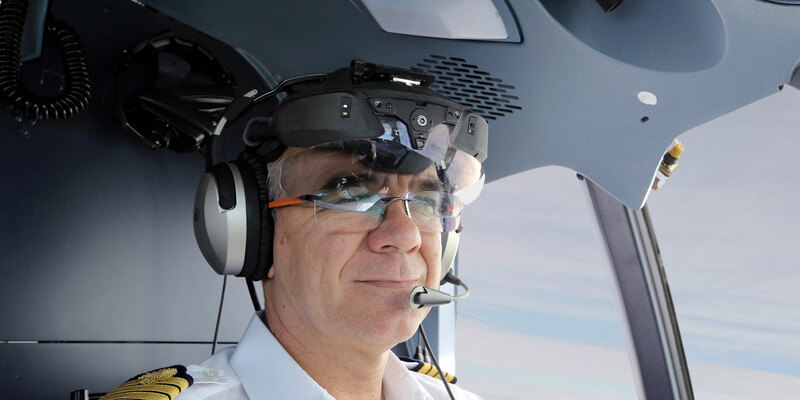 Regional airliner maker ATR and Elbit are working together to introduce a new wearable head-up display that combines infrared enhanced vision with flight parameters. The equipment could be certified by the summer of 2017. ATR (Chalet B25) and Elbit (Hall 1, Stand A100) are collaborating to develop new optional equipment for improved safety in poor visibility, using a wearable display. The system combines infrared-based enhanced vision with flight parameters. Compared to a conventional head-up display (HUD), a benefit of the ski goggle-shaped device is the greater field of view. Certification is expected in the summer of 2017. The ClearVision system uses Elbit’s SkyLens head-mounted display and an infrared camera (seeing at night and through fog) located on top of the aircraft’s nose. The symbology includes a number of parameters—altitude, height, speed, autopilot mode, ILS information and attitude. “We gather these from the avionics buses,” said Eric Delesalle, flight test director of ATR. What is displayed depends on the flight phase. In approach, the symbology is decluttered for the pilot to focus on the runway, speed and height. Only the pilot in the left seat will be equipped with the wearable device—for cost reasons, Delesalle said. On a head-down display, the pilot in the right seat will be able to see a copy of what appears in the SkyLens. The equipment, which is to be donned just before the approach phase, is similar to wearing glasses and an audio headset. It weighs about 0.7 pounds (just over 300 grams), according to Delesalle. A stick-mounted push button enables the pilot to deactivate the infrared image. He or she can thus return to naked eye vision (augmented with symbology) quickly. ATR has been more interested in a wearable display than a conventional HUD. The latter would have been more expensive and trickier to integrate in a relatively small cockpit, Delesalle said, while the former has an unlimited field of vision, he added. The European airframer chose Israel’s Elbit because it was the only provider of such a system when the airframer began to consider it. The first prototype was installed on an ATR aircraft “four or five years ago,” Delesalle said. At the time, it was not very comfortable and the symbology was very simple. “But it was very promising and we conducted a landing where the equipped pilot could see the runway only on the SkyLens display,” Delesalle said. The left half of the windshield had been blackened and a straightforward camera had been installed in the cockpit, on the right side. This summer, ATR and Elbit are resuming the development of the system, now in its final configuration. EASA and the FAA have been involved very early in the process, as the system will be the first of its kind in civil aviation. Both authorities participated in demonstration flights and have jointly prepared a certification review item, with the aim of updating the existing AMC2511 standard for HUD approval. The future option has already generated interest from some ATR customers. Canary Islands carrier Binter Canarias, for example, believes it would be helpful to cope with mist that forms close to the sea. In a second phase, synthetic vision will be added. Fusion of the two images (infrared and synthetic) will be possible—or the pilot may choose just one of these, depending on the flight phase. The SkyLens will thus become a combined vision system.